A half hour’s ride brought them to a beautiful grove, where they landed, and search parties were sent out in different directions. In a short time triumphant cries were heard over the discovery of large watermelons found hidden in secluded spots. (A boat with supplies had been sent up the river ahead of the party.) After justice had been done to the melons the girls went upstream until they landed and were told to raid the country. The enthusiasm of the moment sent everyone forth to discover this time ears of corn. These were loaded into the boat, and the party again set forth toward other lands, in search of whatever they might find. . . fruit hanging from branches of trees. The last voyage brought them to land just about sunset. They did not need to search long before many parcels were found, containing ham, bacon, beefsteak, sandwiches and marshmallows, which, with the corn for the corn roast and the fruit, provided a substantial supper. Further search brought them to a pile of wood for a bonfires, just waiting to have the match put to it. It was not long before the girls were sitting around a roaring fire, cooking their meal, and last of all, toasting marshmallows and telling stories as they watched the fire die out. The trip down the river by moonlight was not the least of the afternoon’s enjoyment. How fun is this?! I love that someone went ahead and left stuff for them to find–a treasure hunt! The American Girl Scout movement was started in 1912 and there was also a similar organisation called Camp Fire Girls established about the same time. https://en.wikipedia.org/wiki/Juliette_Gordon_Low So perhaps this article or this activity was influenced by the new trends for girls. Hi. I remember a lot of older books where girls are depicted as adventuresome. Campfire Girls, Madge Morton and her houseboat adventures, etc. What fun! Despite the cumbersome clothes. That sounds like a fun adventure even for modern times! The simple things of life – enjoyable then as well as now! Lovely article! Good, old photos. Look like fun!. I’ve been reading some old books from the late 1890s/early 1900s and they have those kind of delightful outtings too. This sounds like a variation of the scavenger hunts that were common in my childhood and youth, not to mention my years at Camp Fire camp. I know this: I’d far rather put on one of those outfits and go with those girls than run around with a cell phone, looking for PokeMon. 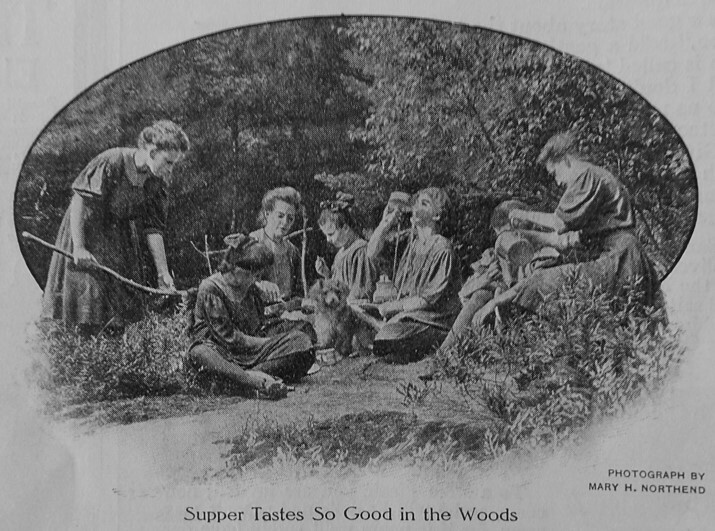 I love the caption for the last picture, “Supper Tastes So Good in the Woods.” Food does seem to taste extra delicious when eaten outside. The hostess sure put a lot of creative thought into entertaining her guests! It looks as if women and girls did know how to have fun, even a hundred years ago! I love reading your blog, because I discover so much about what life was like a century ago. Keep the posts coming! I would love to have met the woman that organized this outing!